If you have trouble viewing this newsletter, click here. Welcome again to our monthly newsletter with features on exciting celestial events, product reviews, tips & tricks, and a monthly sky calendar. We hope you enjoy it! Cold winter nights offer wonderful observing opportunities, but you’d better dress warmly to enjoy the show! Starting July 1, 2007, Arkansas teachers can use state funds to purchase Starry Night® Middle School at special prices from their local depository. The Thirteen/WNET & WLIW21 Celebration of Teaching & Learning's JPMorgan Chase "Multimedia in the Classroom" Awards Competition. We've made over 20 optimizations since the 6.0.1 update in October. Clusters, double-clusters, galaxies, and nebulae—Perseus is a jewel cache. Ken Stewart's stunning Thin Crescent Moon. It’s winter in the Northern Hemisphere and we’re at our closest point to the Sun. Closest? Yes, you read that right. Closest. For northerners, the winter solstice has just passed. But the truth is, on January 3, 2007, Earth reaches perihelion, its closest point to the Sun in its yearly orbit around our star. At first glance, it makes no sense. If Earth is closest to the Sun in January, shouldn’t it be summer? Maybe, if you live in the Southern Hemisphere. So what does this mean? Earth’s orbit is not a perfect circle. It is elliptical, or slightly oval-shaped. This means there is one point in the orbit where Earth is closest to the Sun, and another where Earth is farthest from the Sun. The closest point occurs in early January, and the far point happens in early July (July 7, 2007). If this is the mechanism that causes seasons, it makes some sense for the Southern Hemisphere. But, as an explanation for the Northern Hemisphere, it fails miserably. In fact, Earth’s elliptical orbit has nothing to do with seasons. The reason for seasons was explained in last month’s column, and it has to do with the tilt of Earth’s axis. But our non-circular orbit does have an observable effect. It produces, in concert with our tilted axis, the analemma. If you plot the noontime position of the Sun in the sky over a one-year period, it produces a figure-eight shape on the sky (Figure A). 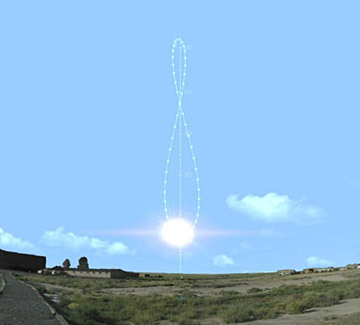 This is the analemma. You may have seen it drawn on a globe of Earth. The shape results from the combination of two things: the 23.5° tilt of Earth on its spin axis, and the elliptical shape of Earth’s orbit around the Sun. The highest point on the analemma is the Sun’s noon position on the summer solstice. The lowest point marks the winter solstice. The difference in the Sun’s noontime height in the sky is caused by Earth’s tilted axis. What about the left-to-right variation in the analemma’s curve? That’s where our elliptical orbit comes in! Look at Figure A again. Notice the vertical line running up from the south point on the horizon? That’s the meridian. The meridian runs straight up and over the sky, from due north to due south. Figure B—Mars is tilted with respect to the plane of its orbit, just like Earth, only a touch more, at 25.2°. But Mars' orbital eccentricity is more than five times larger than Earth's. 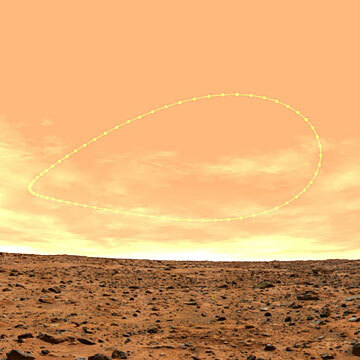 Combined, these facts produce the Martian analemma above. If Earth's orbit was a perfect circle, the Sun would cross the meridian at noon every day (ignoring daylight savings time). But our orbit is slightly oval-shaped. In July, we are at our furthest point from the Sun, and Earth moves slower than average along its path. 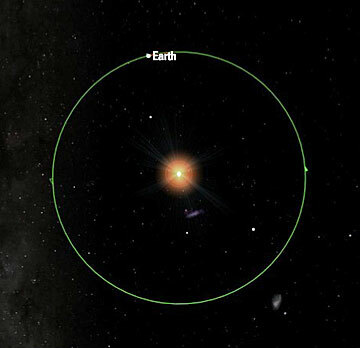 In January, we are closer to the Sun, and Earth speeds up a bit in its orbital progress. The result of this change in speed means the Sun crosses the meridian a little early, or a little late, depending on where Earth is in its orbit. For all points along the curve to the left of the meridian, the Sun is “slow.” It crosses the meridian after 12:00 p.m. For all points along the curve to the right of the meridian, the sun is “fast,” crossing the meridian slightly before noon. Astronomers call this the equation of time. It is marked on many sundials. The equation of time is defined as the difference between true solar time (determined by the Sun’s position in the sky) and mean solar time (the time told by your watch). The two times can vary by as much as 16 minutes over the course of a year. Earth reaches perihelion on January 3, 2007 (Figure C). The Earth-Sun distance will be 147,093,602 km. Aphelion, the greatest distance from the Sun, occurs on July 7, 2007, when the Earth-Sun distance will be 152,097,053 km. The difference between the two is 5,003,451 km, (3.3 percent), and not enough to cause the seasons. Even though, at this time of year, we're as close to the Sun as we can get, for the Northern Hemisphere, it will always be winter. For those of us who live in northern climes, winter astronomy is a mixed blessing. Some of the finest objects in the sky are best placed in winter time, but the cold weather often keeps us from enjoying them. In this article I’ll give some tips for winter observing, and then highlight some of the sights that will make it worth braving the cold. Crisp winter days can be enjoyable when the Sun shines brightly and you can walk/ski/snowshoe briskly. It’s a different matter standing or sitting very still peering through an eyepiece under a winter night sky. The first thing to do is to dress warmly, in layers, in order to retain your body heat. Because astronomy doesn’t involve much physical movement, you should dress as if the temperature was at least 10 degrees colder than predicted. The clothing sold for other winter outdoor activities serves very well. I recently discovered jeans lined with flannel at a work clothing store, which serve well on milder nights; I have a fully insulated one-piece boiler suit for really cold nights. A warm hat is especially important, as we lose much of our body heat through our head: I usually wear a wool watch cap. On really cold nights, a ski mask or balaclava is really welcome. It’s also important to keep your feet warm: cold feet will kill your observing interest faster than anything else. Insulated working boots will do the trick, but it also helps if you put down an insulating mat under your observing area. There are some serious safety concerns in winter observing. Hypothermia can creep up on you very subtly. If you’re observing from a remote location, always use the buddy system, and make sure your buddy has his own car, in case you have trouble starting yours. I prefer observing close to home, where I can step inside every hour or so to warm myself up. Be very careful around the metal parts of your telescope: it’s extremely easy to freeze your flesh to any exposed metal parts of the scope. If it happens, warm things gradually and separate with great care. A warm beverage in a thermos can help to keep you comfortable, but avoid caffeine and especially alcohol. Most telescopes are manufactured in parts of the world warmer than where we live. The only telescope I own which seems really happy in winter is my Russian-made Maksutov-Newtonian, which seems to feel right at home at sub zero temperatures! Telescopes give trouble in two specific areas: lubrication and batteries. The lubricants used in telescope mounts, focusers, etc. turn into glue at low temperatures. It’s best to strip off the supplied lubricant and replace it with the lithium-based greases designed for snowmobiles. Batteries depend on chemical reactions to generate current, and chemical reactions go more slowly at lower temperatures. Generally, the smaller the size of the battery, the sooner it will fail at cold temperatures. I often store my telescopes in an unheated garage or shed, but I always store the batteries inside my heated house. The little AA and 9v cells used in most astro equipment are next to useless below freezing. If you’re close to home, use an AC adapter to power your equipment. If you’re in the field, look into the “power tanks” sold by many astronomical suppliers. But before spending a lot of money on one of these, check your local auto supply store for less expensive alternatives. Once again, the larger the physical size of the battery, the longer it will last, and be sure to store it indoors on a trickle charger. It may be tempting to run your equipment off your car’s battery, but you don’t want to find yourself with a dead battery when you want to head home. It’s best to store your telescope in an unheated garage or shed, rather than subjecting your scope to drastic temperature changes, plus the heavy condensation which can occur when you bring the scope indoors. If you must bring a very cold scope indoors, cap it tightly while still outside to minimize internal condensation. The same applies to eyepieces and other accessories. Is it worth going to all this trouble, rather than staying indoors and viewing Hubble images on the internet? Definitely! Some of the sky’s finest sights are overhead in wintertime. This is without argument the finest emission nebula in the sky. It is easily found as the middle “star” of the Sword of Orion, hanging below his famous Belt. This is a fantastic site in even the smallest telescope, and only gets better the larger your telescope’s aperture and the darker your sky. Try it with every eyepiece you own, with and without a nebula filter. Every view is different, and every one rewarding. I can easily spend an hour or two exploring this wonderful object on any clear night. Try to trace the outermost tendrils of its two widespread arms. Then put on your highest magnification and see how many stars you can see in The Trapezium, the glorious multiple star at its core. The four brightest stars are pretty easy, but can you spot the elusive fifth and sixth stars? These require good optics and a dark sky, as they are buried in the glow of the surrounding gasses. Double star observing used to be a mainstay of amateur astronomy, but got shoved aside by deep sky observing for many years. Recently it seems to be enjoying a comeback with several new books published on the subject. Summer may have its Ring Nebula and Dumbbell Nebula, but winter’s Eskimo Nebula will challenge both of these as the finest planetary nebula in the sky. Located close to the fine double star Wasat (Delta Geminorum), it is easily mistaken for a star at low power because of its small size and brightness. The brightest and one of the closest open star clusters in our neighborhood, The Pleiades makes a fine sight on a crisp winter night. How many stars can you see with your naked eye? Most people can see six, but more can be detected with careful observation. Because of its large size, this cluster is best viewed with binoculars. Under really dark skies, see if you can detect the faint nebulosity which envelopes this cluster. Don’t be fooled by haze in our own atmosphere. A good test is to compare the view with the nearby Hyades, which have absolutely no nebulosity associated with them. I saved the best for last! Saturn is now rising in the mid-evening, and is a treat for all astronomers. This planet can tolerate as much magnification as your telescope is capable of, so don’t hold back. Look for the shadow of the rings on the planet and vice versa. See if you can detect the hairline Cassini division between the two main rings; how far around the ring can you follow it? Try to spot the faint inner Crepe Ring, most easily seen against the background of the planet, but sometimes visible against the sky. Can you see any belts on the globe, or its greenish polar region? Scan the area around Saturn for its moons. Use Starry Night® to print a map of their locations. 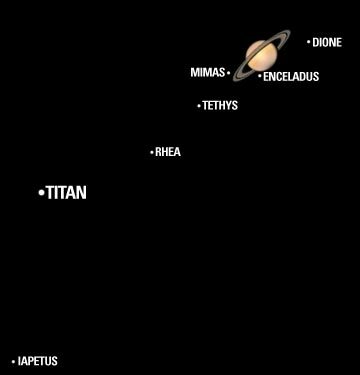 Titan is easily seen in any telescope. Rhea is more of a challenge and Tethys and Dione require a good eye and telescope. Iapetus follows an odd orbit, and changes in brightness as it moves from west to east. Enceladus is extremely challenging, and tiny Mimas just about impossible. So remember: Dress warmly, be prepared, and enjoy the wonderful sights of the winter sky! Geoff has been a life-long telescope addict, and is active in many areas of visual observation; he is a moderator of the Yahoo "Talking Telescopes" group. We have been listening to your feedback and are happy to announce the release of the FREE version 6.0.3 update for owners of Starry Night® version 6. Please read our update instructions. Next, right-click on the Sun and select Local Path. Quadrantid meteors peak. The Quadrantid meteor shower is one of best annual meteor showers. Unfortunately, this year the shower peaks just after full Moon, which will cut down on the number of faint meteors seen. The best time to look is around 11 p.m. on the night of January 3rd. 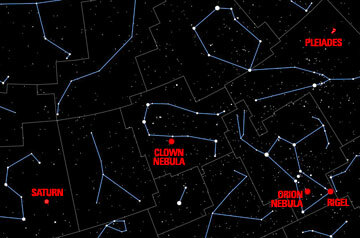 No equipment is needed, just use your eyes and look to the northeast in the direction of the constellation Bootes. If these meteors appear to stream from a point in the constellation Bootes, why are they called the Quadrantids, rather than the Bootids? This meteor shower was named before the modern constellation boundaries were set. Its radiant lay in the constellation Quadrans Muralis, which was incorporated into Bootes when the modern constellations were standardized by the International Astronomical Union in 1922. Yes, Quadrans Muralis suffered the same fate as Pluto at the hands of the same organization! This event will only be visible from northeastern Russia, northern Scandinavia, northwestern Canada, and Alaska. Further south, the Moon will pass north of Saturn or the whole event will be below the horizon. This event will only be visible from the southernmost regions of South Africa and South America, plus most of Antarctica. Further north, the Moon will pass south of Venus or the whole event will be below the horizon. Even though the Moon and Venus will be separated by two degrees at dusk in North America, the slender crescent Moon and the brilliant Venus will make a spectacular pair. Mercury is too close to the Sun to be observed until late in the month, when it appears below Venus just after sunset. Venus is now visible as an “evening star” just after sunset in the southwestern sky. Because it is still on the far side of the Sun, it is small in size and appears almost full in a telescope. Mars is on the far side of the Sun, presenting a very tiny disk in a telescope. It is visible low in the southeast just before sunrise. It will be too small to show much detail until summer. Jupiter is now a bright “morning star” rising low in the southeast before the Sun. It will be in the constellation of Ophiuchus for most of the year. Ophiuchus is sometimes called the 13th constellation of the zodiac: a large part of the ecliptic now crosses this constellation between Scorpius and Sagittarius. Saturn is in the constellation Leo, rising around 8 p.m. and visible all night. It is perhaps the finest sight in the sky with its beautiful rings, visible in just about any telescope. While viewing Saturn in a telescope, scan the sky nearby for its collection of moons. Titan is always visible, while its fainter cousins reveal themselves in larger amateur telescopes. The other planets are all too close to the Sun to be readily observed. All times shown are U.S. Eastern Time. If you publish a space or astronomy Web site or blog, earn extra cash by promoting Starry Night® on your Web site. It's easy to join and it's free! Do you have a question, comment, suggestion or article idea to pass along to Starry Night® Times? Starry Night® is the world's leading line of astronomy software and DVDs. Visit starrynight.com to see all the great products we offer for everyone from novice to experienced astronomers. You have received this e-mail as a trial user of Starry Night® Digital Download or as a registrant at starrynight.com. Starry Night® is a division of Imaginova® Corp.
To subscribe, sign up here. 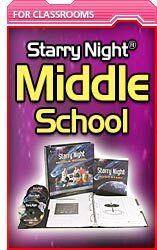 The Arkansas Department of Education has adopted Starry Night® Middle School as approved instructional materials for science, grades K-8. Starry Night® Middle School has already been adopted by New Mexico, and California has deemed Starry Night® Middle School to be compliant. Case studies have proven Starry Night® to be effective in teaching space science concepts. The Thirteen/WNET & WLIW21 Celebration of Teaching & Learning's JPMorgan Chase "Multimedia in the Classroom" Awards Competition, sponsored by JPMorgan Chase, recognizes innovative and effective practices and projects that demonstrate how learning can be improved in the K-12 curriculum in science and global awareness through the use of multimedia and technology by teachers and students. This would be a great opportunity to share resources you may have created using Starry Night® that makes effective use of multimedia and technology in support of science and motivates K-12 students and their teachers to explore learning possibilities. $1,000 Cash Prizes to each of the top 10 winning school teams! Winners receive free full access admission to the Celebration and Teaching & Learning conference, March 23-24, 2007! Free Celebration Tee Shirt for winning Teachers! K-12 teachers and students in public and non-public schools in the tri-state area (New York, New Jersey, and Connecticut) are eligible to participate. All entries must be postmarked by 2/2/07. The FREE Starry Night® version 6.0.3 update is now available for download. Opening and closing the side panels no longer resizes the FOV! 3DS models now load significantly faster. 3DS models no longer look washed out after zooming in on sun. Several significant fixes to Calendar event adding and display. Events are now correctly added and displayed in local times. Added new buttons to set Calendar date to date shown in Starry Night® view. OpenGL now starts correctly (as in 6.0.0) for low-capability video cards. Saved presets now load correctly when saved with no file extension and selected from menu. Asteroid diameters correctly reported. Were showing as 2x actual value. Correct object limiting magnitudes set for PGC catalog. Limit stars by distance and other fields like this now work correctly. Satellites can again be added orbiting the Moon. Click here for the complete list of fixes. You must be connected to the Internet to receive the update. Download the installer by checking for updates. Windows users should click on Start>All Programs>Starry Night® (Enthusiast 6, Pro 6, Pro 6 AstroPhoto or Pro Plus 6) >Check for Starry Night® (Enthusiast 6, Pro 6, Pro 6 AstroPhoto or Pro Plus 6) Updates. Macintosh users should click on Macintosh HD>Applications>Starry Night® (Enthusiast 6, Pro 6, Pro 6 AstroPhoto or Pro Plus 6) >(Enthusiast 6, Pro 6, Pro 6 AstroPhoto or Pro Plus 6) Updater. Run the installer. When you launch Starry Night®, you will have version 6.0.3. Please be patient as there may be a number of people downloading at the same time. As an added bonus, receive $20 instant savings on your purchase of a Starry Night® Version 6 upgrade. During checkout, simply enter coupon code snv603. NGC 869/884, the Double Cluster, is a favorite target and with good reason. Use binoculars to get an overview of this jewel box, then a low magnification in your telescope to bring out the distinctly varied coloration of stars in each cluster. Both clusters are about 7000 light-years away and are part of the Perseus arm, one of the spiral arms of our Milky Way. M76, the Dumbbell Nebula, is another favorite among observers because of its obvious hourglass/dumbbell shape. It's faint and small but responds well to magnification. Averted vision will help you see its two distinct lobes and nebulous wisps. NGC 1245, an open cluster, is best viewed with low magnification. Most of the stars are hot blue, but there are some nicely contrasting bright orange stars, cooler and older than their blue house mates. M34, another star cluster, contains about 60 members including several double-stars. The cluster is 1,500 light-years distant and is moving in the same direction through space as the Pleiades. NGC 1023, an very elongated looking galaxy, hangs in space roughly 30 million light-years from the back of your eye. From that distance it's surprisingly bright, especially the middle. Try all magnifications to pick out structure and details. NGC 1499, the California Nebula, is a large emission nebula. Under dark skies, it's bright enough to see with the naked eye. Use low magnification and a nebula filter if you have one. See if you can make out the shape of the state that gives the nebula its name. 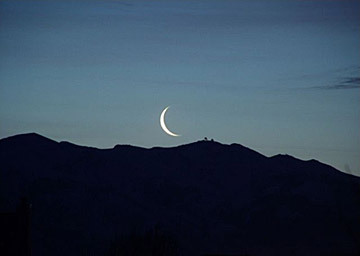 Thin Crescent Moon taken by Ken Stewart, West Haven, Utah with a Fuji Finepix S700 Digital Camera. The ISO was 200 and the exposure 1/2 second. We would like to invite all Starry Night® users to send their quality astronomy photographs to be considered for use in our monthly newsletter. Featured submissions (best of month) will receive a prize of $75 USD. Please read the following guidelines and see the submission e-mail address below. Format: Digital images in either JPG, GIF or TIFF format. Size: 700 pixels wide maximum. File size should be less than 2 MB. Include a caption: Your full name, location where photo was taken and any interesting details regarding your photo or how you took it. Please be brief. Important notes: We may edit captions for clarity and brevity. We reserve the right to not use submissions. In submitting your image or images to Imaginova®, you agree to allow us to publish them in all media -- on the Web or otherwise -- now and in the future. We'll credit you, of course. Most important, you'll have the satisfaction of sharing your experience with the world! Send images, following the above guidelines, to photo@starrynight.com (by sending an image you agree to the above terms, including Imaginova®’s right to publish your photos). Please do not send .ZIP files as they will not reach us. © 1999-2007 Imaginova® Corp. All Rights Reserved. or as a registrant at starrynight.com. To unsubscribe, click here.